Great angling. 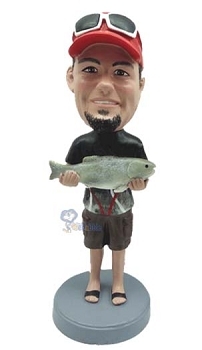 custom bobblehead doll man holding a fish in both hands. This sample depicts a person wearing a hat and sunglasses on the his head, this item does not come with the hat or glasses. These options can be added to any item with the options on our order form.